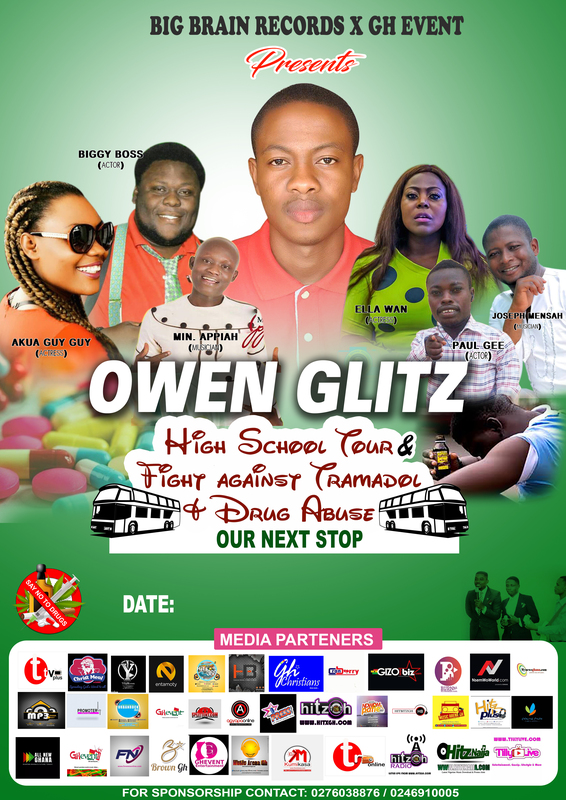 Big Brains Records presents in collaboration with Ghevent the Owen Glitz high school tour against tramadol and drug abuse. The high school tour against tramadol and drug abuse is an educative program put together by the Jehovah is soo good hitmaker to educate Ghanaians especially high school students accross the nation on the negative effects of tramadol and other substance abuse. The alarming number of youth abusing tramadol and othe drugs in the country is what has made the urban gospel musician and his management team embark on this tour in the various senior high schools so as to educate them on the negative effects of the abuse of these drugs and how to avoid them in order to become responsible citizens who will contribute their quota to the development of their country. This step taken by the urban gospel musician is a very laudable one that ought to be emulated by all Ghanaians and other celebrities especially,to save the future leaders of our motherland Ghana from the negative effects of tramadol and drug abuse. Previous EVANGELIST AKWASI KABORE ABDULAIH MOSES SET TO MARRY.